Whether you’re a power user or not, knowing your way around the command prompt can come in handy. In this day and age, many users would probably say they have no reason to be exploring a command prompt; especially with all the richness of the graphical user interface (GUI) advancements over the past 20 years. True, but it doesn’t hurt to collect a few tricks or more, especially for those times you might be in a tight spot. The command line is an interface that provides all the same facilities as those found in the GUI. In fact, for many years, this is how users operated a computer; it was just a fact of life. Sure, it’s the exception today, but it’s a great way to brag to your friends about what you know. Plus, once you get comfortable with the command line, you may even prefer it to the GUI for some tasks. Today, we take a look at several commands you should know. Let’s jump in. The command line is similar to Alice in Wonderland—it can at times feel like a land full of wonder, mystery, and (possibly) danger. Our psyche has been so greatly changed by the power of the GUI, for many of us, the command line can feel primitive. But it shouldn’t and that’s why we are going learn some fun ways you can use it to perform some of the same tasks you normally do using point and click. Command line operations come in handy when you want to create scripts and automation tasks, too. Before we begin, check out our previous article for instructions how to find and open the Command Prompt. Some of these commands call for administrator privileges, so, that’s a good way to start off our adventure. If want to see what’s listed in a folder when you open the command prompt, type dir (short for directory), then hit Enter. A list of the folder contents will be displayed, which might include files and other folders. Depending on the folder, a lot of information might flash across your screen. When you want go back to a blank screen, type CLS to clear the screen. The command line supports creating a user account too. You can even create accounts with specific privileges. This is how you do it. Type: net user Username Password /add then hit Enter. You should see the following message: “The command completed successfully.” Click Start > username then switch to your new account. In the graphical user interface, browsing and navigating through the File Explorer file manager is a simple point and click affair. The command prompt requires an argument when you need to change from one location to the next. When you open the Command Prompt with administrator privileges, it defaults to the System32 folder. To go back to your user folder, you need to take a few steps back by typing cd.. This will take you a step back, similar to the Up icon in the File Explorer window. When you are within the vicinity of a folder location, for example, drive C:\ you can type cd folder name to open the sub folder within. Here I can perform actions such as listing the contents of the folder using the dir command. Creating folders, copying and pasting files; these are everyday actions we perform in the graphical user interface. The command line can do it too. Here we have both the command line and File Explorer on screen and we have changed our directory to the folder called Sample located in Documents. Right now, the folder is empty, but we want to create a folder called Groovy to store some files. This will create a folder in the location we just specified. If you want to create it somewhere else, use the CD command to navigate to that location. If you want to create more than one folder at once, just type md (make directory) followed by the name of each folder with a space between. Example: md Work Files. This will create two folders called Work and Files. If you want to move the folder to a different location on the drive, this will require using the move command and knowing the path destination where you want the folder to be moved. Let’s give that a try. I want to move Work folder from the Groovy folder to the root of the Sample folder. Copy: If you just want to copy files or folders from location to the other. Xcopy: A robust copy option suitable for copying the contents of a folder with subfolders to a destination folder. Xcopy is being superseded by Robocopy which provides the same functionality. Here are some examples how to use these copy commands. 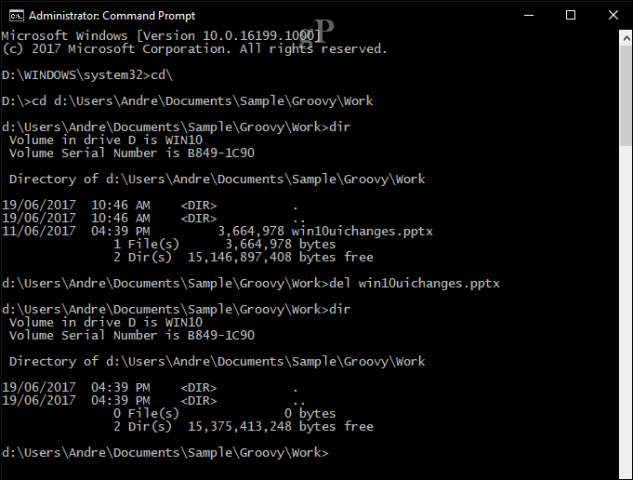 I want to copy the PowerPoint presentation named Evolution of the Settings interface.pptx to the Work folder located in the Groovy folder we created earlier. First, change your directory to the location of the file. Since Robocopy has superseded Xcopy, we are just going to focus on using that command for this example. Robocopy includes a number of arguments you can use to copy lots of folders thoroughly. It’s particularly great for creating backups. For instance, if I want to make a backup copy of my Downloads folder to a folder on my thumb drive named Backup, this is how you do it. If you want to quickly recover the contents of a drive that won’t boot, this is one of the fastest and most reliable ways to do it. You can add other arguments for specific results, for example, /mir command added at the end of your command will ensure permissions from the source folder is maintained at the destination. Network command line operations are available, too; there are quite a lot actually, but here are a few you should keep handy. The ipconfig command is one you will likely come across from time to time. It’s used to view the IP address of your computer or network. Finding your IP address in the Windows GUI is easy, but buried; the command line is a faster way to find it. Just type ipconfig or ipconfig/all to view addresses of your network adapter. You can also use ipconfig to retrieve a new address. If you are on a business network, this can help resolve issues logging onto the network or accessing resources such as a mapped network drive. At the command prompt, type ipconfig/release, hit Enter, type ipconfig/renew then hit Enter again. Ping is used to check the status of a network address, which lets you determine if packets are being sent and received. A packet is a method of sending information along with its address over the network in small pieces, which is routed using different paths depending on the type of protocol used. Tracert or Trace Route determines the route information takes to reach its final destination over the network. Similar to Ping, Tracert is most effective as a diagnostic tool when you are experiencing problems reaching a website. If I want to know the route it takes for my ISP to reach groovypost.com, all I need to type is tracert followed by the domain name or IP Address. 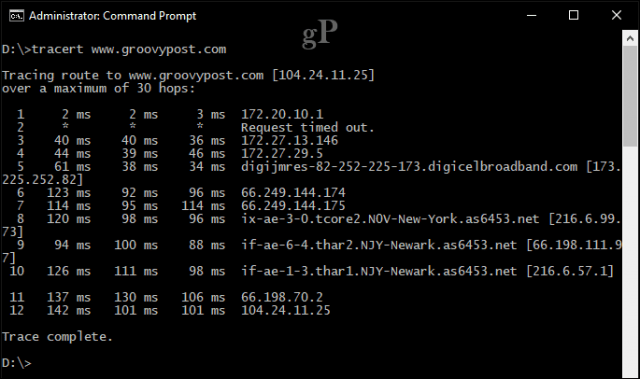 DNS Flush: DNS converts IP Addresses into simple names such as 104.24.11.25 into www.groovypost.com. Sometimes when you are unable to resolve an address, clearing your DNS cache can fix the problem. You can use the DNS Flush command ipconfig/flushdns. You can go ahead and browse the contents of the folder using the same commands we previously demonstrated. If you want to connect to a specific subfolder over the network, you can use the pushd command followed by the network path, example: pushd \\ELITEBK-INSIDER\Wiki Projects. This is similar to change directory command. You can also start an application install from the command line too. In fact, I recommend you give it a try when you experience problems with the GUI. Simply change to the directory then type the name of the application setup file followed by its extension. DISM (Deployment Image Service and Management Tool) is a tool you can use to perform command line diagnostics on the health of your Windows 10 installation. It is primarily used in deployment scenarios, but for end users experiencing problems such as system stability or performance, DISM can help fix such issues. 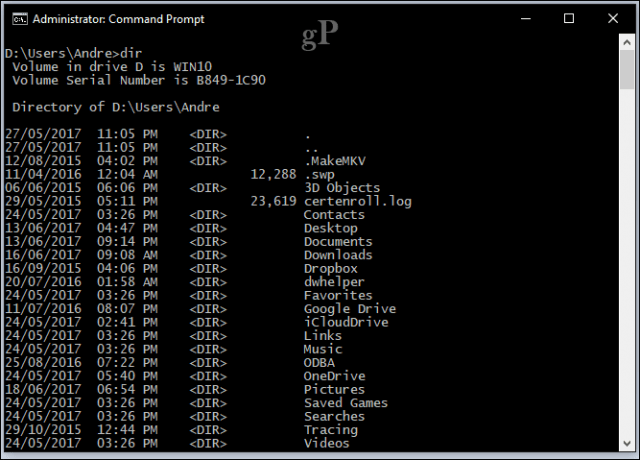 At the command prompt, type each of the commands one at a time, allowing the operation to complete in between. System File Check tool is an oldie but goodie. This command line tool can be used in addition to DISM to scan and repair corrupted Windows system files. If it finds any corrupt files, it will restore a backup copy from a backup store in the System32 folder. To use it, just type sfc /scannow at the command line then hit enter. The process can take some time depending on the severity of the issue. We have covered these in detail before, so I won’t go into details—check our previous article on How to Find Your Systems Complete Specifications in Windows 10 for details to learn more. If you want verbose details about your system, such as initial date Windows 10 was installed, registered owner, BIOS version info, last time the system was booted, this is a great way to find it. Working with disks through the command line is an important task you should learn too. We previously covered the steps how to format, partition and label disks using the built-in DiskPart command line tools. Check Disk is another import command line tool you should know since you can use it to diagnose and fix issues with your hard disks. This is just the tip of the iceberg when using the command line. I don’t expect you to learn everything right away, but for the beginner or intermediate users, these can be quite a helpful introduction to learning its hidden powers. Are there any particular commands I missed that you think should be a part of this tutorial? If so, let us know in the comments. FOR – this has some powerful features. Not just selecting a range of files but is able to extract tokens from within files. You could cover usage of pipe (|) and output redirection (. and >>)symbols. There are also several other commands that are used within batch files. Great feedback Phil. Thanks for showing those. Will have to do a follow-up article on this – Command Line (Advanced) tips! In scripting, FOR is critical. FINDSTR is also another great one that many ppl forget about. However, I never knew about ASSOC so that’s a new one for me. Nothing like going “Old School”. :D Youngster look at me wide-eyed when I drop to a command line and start poking around. I go waaaay back, my first PC ran on PC-DOS 1.0, and I was part of the Beta Team for Windows 3.x Win9x. I will be totally lost if they ever take the command line completely away from me. I guess I’ll just have to go back to the abacus. Come on Andre — Simple DOS level commands have been around since CPM BASIC! The factoid that DOS Commands aren’t taught anymore simply means that Computer OS Courses are not providing the Basics! I have long disparaged modern day Computer Programming Courses as deliberately ignoring the background on how such programming languages developed over time as Processors and Memory became as cheap as they are today. I find it fascinating that even with WIN10 and ServerX, so much still requires knowledge of the DOS Level Command Line. The last time I followed a groovypost command line suggestion was when Brian suggested automatically cleaning the temp folder during boot was a good idea way back in 2014. I followed it and then regretted it from having to wait so long for my set of Internet tabs to load. When I asked how to undo it I was directed to the community forum where I couldn’t find anything to help. I’m still regretting it to this day. Thanks for the advice, but no thanks. My bad, Andre! Brains tip was a batch file. @wheelsey. Your batch file maybe an autorun file in which you can stop it running by using a tool from the Windows Sysinternals suite of tools. You will find the download link under the main heading UTILITIES to the left of the screen. Once downloaded, look for autoruns and run it as administrator. Then look at the logon tab and if your batch file is there just untick it. Batch (*.bat) programs use command line tools and are very helpful. Cleaning out your temporary internet files, local temp files and the Widows Temp folder are ones that everyone should run periodically. Too many programs fail to clean up their temporary files when they close. At work I recently asked a local admin to check and clean out my Windows Temp folder. First, he had no clue that Windows requires you to first get permission to the Windows Temp folder or else you can’t cleanup the files. Then, lo and behold, we found 9.5GB (yes, Gigabytes) in left-behind Temp files. My laptop went from red-line disk space to an acceptable amount free. All because I asked for my Windows\Temp folder to be cleaned. Such cleanup of Temp files also serves to delete any malware files that were downloaded, even if not activated. After years involved with Information System Security, I always set IE (and Edge) to delete temporary files upon exit. Don’t take chances. Ideally, your Internet Explorer should be set to refresh each web page on access, not use temp files downloaded to your computer. Why? Many web pages change or are dynamic. Using the “old” copy means you are getting the page as it existed in the past. Best practice is sometimes a tad less convenient, but still best. I agree with you about cleaning them out periodically, but every time I power on my computer just got to be too much. That’s all. Basically it will execute them one after the other. Thanks for that tip Michael! Thats why we love when you leave a comment!